Login to TextMagic using your secure identity provider credentials and easily give access to text messaging to the unlimited amount of team members in your company. Integrate text messaging campaign into your daily workflow via different Single Sign-On platforms. Increase control over your SMS campaigns by giving your team selective access to a range of apps. Vastly reduce access problems by letting your team use a range of apps through just one password. Accessing TextMagic through an SSO app powers up your SMS marketing. Through a Single Sign-On to all your favourite apps, you can synchronise your marketing efforts across devices and channels – providing a unified approach. Save your Single Sign-On passwords in the cloud for users to access via an online portal. Team members then use SSO to access all apps – via mobile, tablet, or desktop. 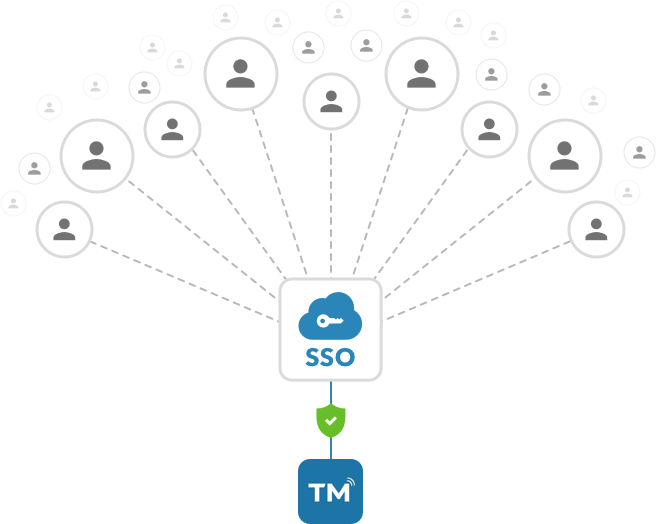 Most SSO portals allow you to create individual workflows. This enables your managers to evaluate performance, delegate tasks and set new goals quickly and easily. Client texts are stored as conversations in TextMagic, making it easy for one team member to pick up from another using a single protected login. Provide Single Sign-On for other platforms that complement SMS, such as SMM dashboards, live chat, email marketing tools, content management systems etc. Here is the full list of SSO portals that support TextMagic. If you already use one, you can configure SSO login for TextMagic with just a few clicks. Provides secure access, password management and multifactor authentication from anywhere. Features thousands of integrated apps, including TextMagic, that support SAML protocols for SSO. Enterprise-grade identity management solution with thousands of pre-integrated apps. Cloud-based password management dashboard providing access to thousands of apps and sites via one protected login. Comes in three editions – free, basic and premium – and integrates thousands of cloud applications. SSO platform for web apps where you can manage all passwords from one dashboard. B2E SSO feature allows access to TextMagic, and many other apps, through a single sign in. Cloud identity platform providing SSO single sign on access to over 2000 apps, including TextMagic. Not Ready To Access TextMagic with SSO? Most SSO platforms provide multifactor authentication and report any inconsistent access patterns, thus reducing security risks. Decide who gets access to which apps from one simple dashboard. Monitor browsing patterns, modify permissions and delete accounts in real time. How much time do your staff spend recovering forgotten passwords? SSO reduces this by automatically logging users into various apps. Cut down on the number of passwords needed and forget about boring spreadsheets by setting one set of credentials per team member. Streamline internal operations by providing one-click access to all apps. Increase application adoption and reduce the number of helpdesk calls. Reduce on- and off-boarding tasks and empower employees by providing instant access to all their tools through SSO safe login. Can multiple people access one TextMagic account using Single Sign-On? Yes, as many people as you like can access a single TextMagic account via single sign on. The number of users per account is not limited, but we recommend you create independent sub-accounts to track activity and usage better. You can share credentials for sub-accounts across departments to improve collaborative efforts. How do I enable SSO for my TextMagic account? Click on ‘Add SAML details’. Fill out the required fields. You will find this information in the admin dashboard of your SSO provider. Click on ‘Save’. You should receive a confirmation message. Note: Please be aware that set-up processes differ between SSO apps. For example, LastPass picks up credentials as you add them to the vault. Other apps, such as ClearLogin, require additional information, like the Public x509 certificate, to work. How do I disable SSO for TextMagic? Navigate to Account Settings → Single Sign-On. Click on ‘Disable SSO Feature’. I followed all the steps but still can’t activate Single Sign-On for my account. What can I do? Our customer care team can help with any difficulties you’re having in setting up your account. You can contact us by phone, send an email to , or use our Live Chat feature. The SSO portals we partner with are all recognised sector leaders that provide the highest level of security. Most platforms provide multifactor authentication, security monitoring, manual encryption, AES-256 bit encryption, automated backups and certified data centres.